We often see people sharing their physical workspaces with intricate desk setups, fancy RAID systems, cool LEDs, and whatnot, but what about our digital workspaces? 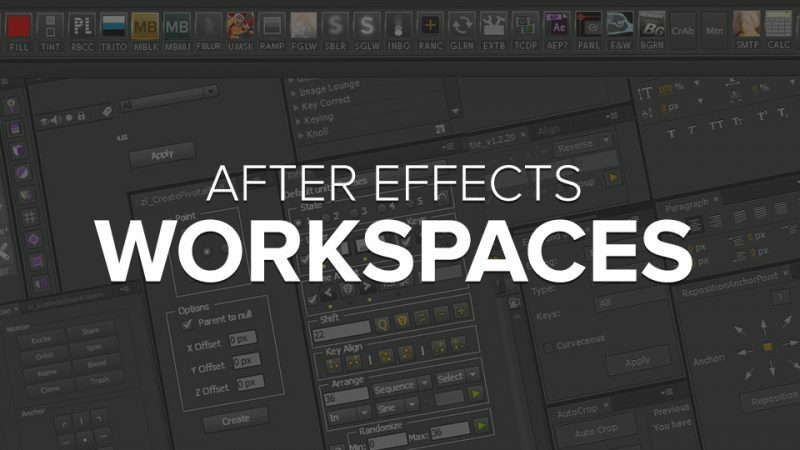 Zack Lovatt on Twitter thought it’d be fantastic to start a post where we could all share our After Effects workspaces and some details about them, so I decided to start one! Andrew Embury‘s workspace is very minimal to allow for total focus on animation. He also says it’s simple so that when he transfers workstations, he’s not lost at another setup. 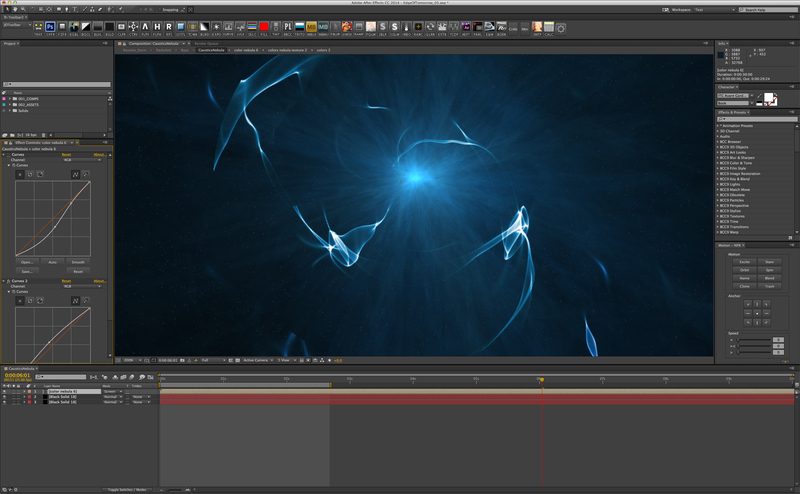 Andrew also uses the Rift script to manage keyframes, and a few of Zack Lovatt’s own scripts such as Create Pivotal Null and Explode Shape Layers. Matt Jylkka of Mt. Mograph has an interesting setup where all his parameters and buttons are to the left, and his assets/searches are on the right. He’s also rocking his own Motion script for his everyday workflow. I feel like every time I watch any of his tutorials, his layout changes anyways! Shinsuke Matsumoto‘s workspace is fairly basic, rocking the same Keysmith & ft-Toolbar scripts for his workflow. By the way, he’s an awesome guy to follow on Twitter for timesaving and useful tricks/techniques for AE/C4D. Zack Lovatt‘s workspace relies on ft-Toolbar and a few other popular scripts, all synced on Dropbox to share amongst his workstations. He uses BG Renderer for managing renders, Rift & Keysmith to manage and manipulate layers and keyframe values, Sortie to organize layers, and Ease & Wizz for fancy easing. 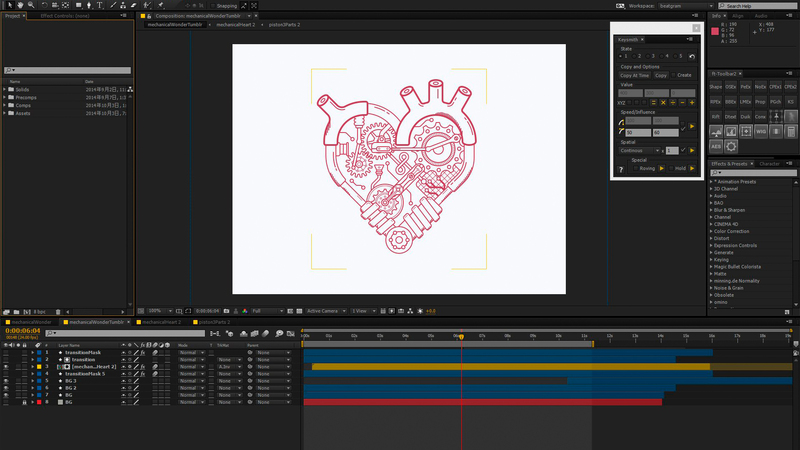 He also uses the popular RepositionAnchorPoint, AutoCrop to crop precomps to its contents, Zorro the Layer Tagger, and Victoria Nece‘s Layer Selector Toolbar for rapid selections. Maltaannon’s Simple Camera Rig. Why would you use anything else? Maltaannon’s Snapshot for quickly saving out current frame. Lots of options. Above is my workspace with a fairly simple layout and minimum custom panels. I used to use ft-Toolbar like everyone else, but decided to develop my own “toolbar” specifically for my work, so everything I need is in my Dojo Toolkit script for the most part. My Effects Controls panel is next to my Project panel because it just makes sense to have them in conjunction with each other. I think taking a look at other designers’ workspaces can be a very inspirational and useful thing. We’re curious to see some of your workspaces, so if you’d like to share yours, feel free to post them in the comments below! What sort of cool voodoo stuff do you have in your workspace? FT-Toolbar has changed the way I work too. I have 3 levels with sub-categories, including effects, scripts, type, comp tools, camera, audio…organizes so many loose odds and ends. Love Tidy, Malty_Closer and Ease and Wizz too. Oh wow, that’s a lot of stuff Orrin! Thanks for sharing! Malty_Closer is extremely handy, wonder when Adobe’s going to implement such a feature. Did not know this, thank you for telling me! It appears that I am the only one using 2 screens (1 main screen for animation, the other one for all the other panels and scripts), and also the only one not using ft-Toolbar (am I ?). But I’m considering to get it soon if everyone say it is worth it ! (and I apologize for my bad english, I’m French and english is not my native language). Wow, thanks for sharing! That’s definitely an awesome workspace, dig the idea of having a “control panel” monitor and a working monitor. 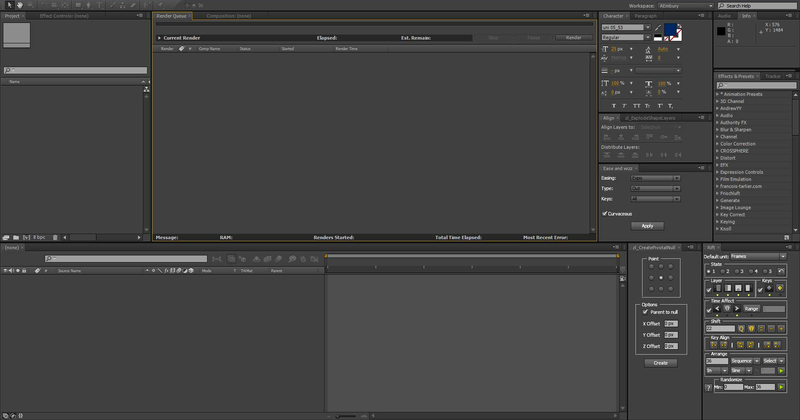 I actually use two monitors as well, just don’t utilize it well with AE. Would you mind uploading the screenshot image in the comments in case you decide to delete it off Dropbox? Would love to keep it to share with others in the long run! Keep in mind that I really often change my workspace to adapt on my projects (but still based on the same principle of 1 screen for animation, the other one for all the other panels). I also often discover new scripts that I add to it. An other interesting topic would be to know how people organize their files within the computer and within the project itself, and also their workflow. 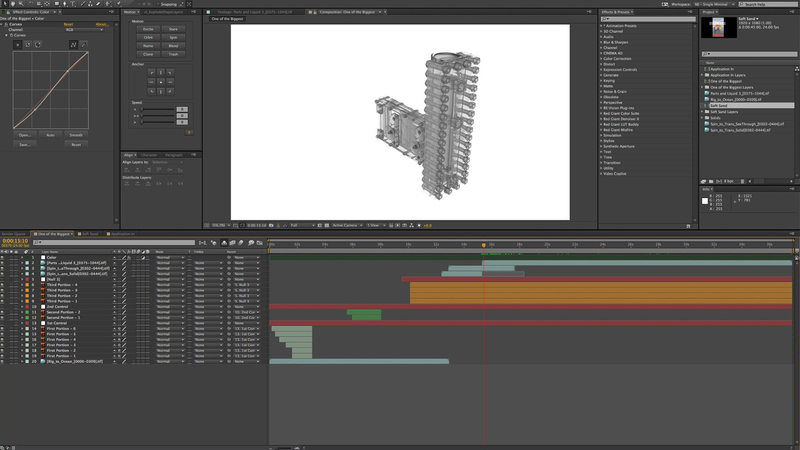 For example, sometimes I render WIP files in mp4 to send in my clients in a Dropbox folder, some other times I render uncompressed files that are encoded via a watchfolder of Adobe Media Encoder… But I haven’t found the perfect workflow yet, and I would love to discuss about it with other professionals ! Awesome! And good idea for a future post! Dual monitor setup. this allows me to have a long timeline, two viewers (one locked to the main comp; the other allows for maneuvering inside and out of precomps). 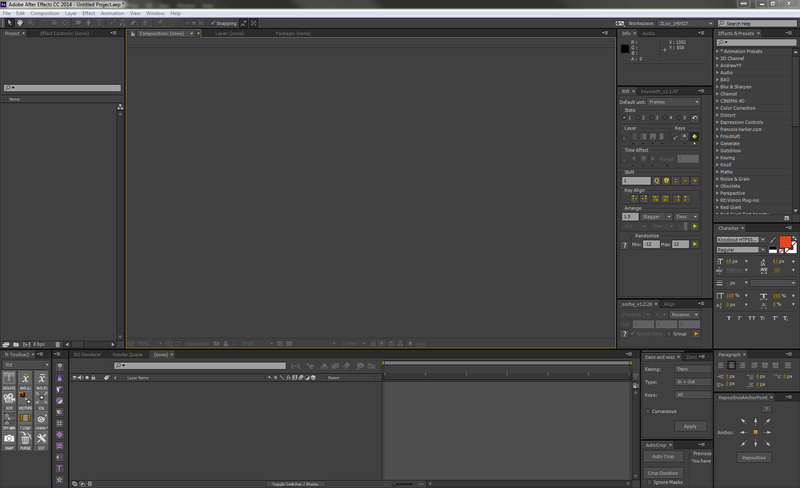 then the second monitor leaves tons of real estate for palettes; no need to clutter up the main workspace! Very cool layout! Yours makes total sense haha, thanks for sharing Jason! Aw, so nice to see Slice it Up made there:) Thanks mate. Yeah at first I thought these were cropped to fit 1 monitor only? I was wondering how nobody would use the typical layout you see in production houses where one screen is dedicated entirely to the layers rack (and maybe watching the Daily Show or some football match when working during lunch). A whole monitor dedicated to the timeline makes a hell lot of sense. Thanks for sharing your setup Oliver! Late to the party but here’s mine. I work with UI’s quite a bit so easing control is my main focus. Dojo Toolkit – great for a variety of random things that make life way easier! **Also – it may seem weird but for me it helps moving the A/V switches (show/hide & lock) column to the far right. Because I hide/show layers often, so having this panel closer to keyframes works better for me. Really nice setup, rocking that Dojo Toolkit script I see! (There’s an update with a slimmer interface, btw). Thanks for sharing your most used scripts! Which script is better overall, the new Motion script by Mt.Mograph or the old Ease and Wizz? Depends on whether you want expressions or not. Ease and Wizz is nice, but it uses 100% expressions which is hard to customize. Motion uses handles to control the graph editor. I use a dual monitor layout at work. MoGraph Toolbox is a little script I wrote that sets up a project file structure, quickly applies effects, and toggles track mattes and null visibility. I use Reposition Anchor Point every day as well. Cheers! Wow, nice setup! Thanks for sharing Kyle! Awesome dude, and sick project you’re working on! Are you aware that Dojo Toolkit v2 is out?! Thanks! 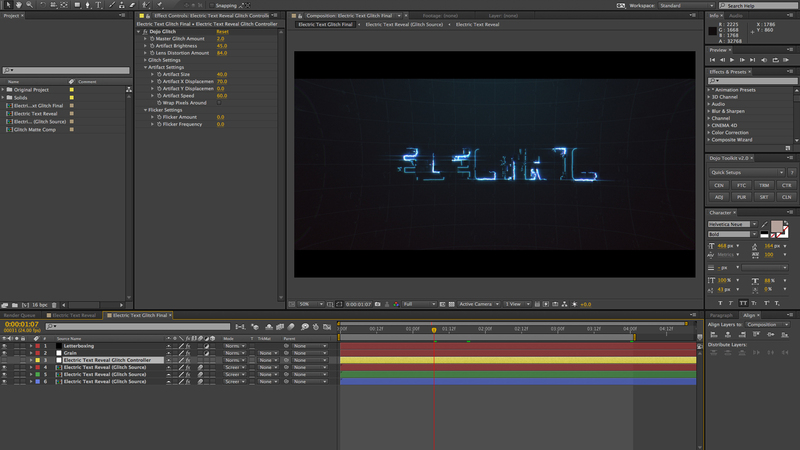 I was just messing around with Form and Plexus. Nothing concrete. I did not actually no v2 was out! Thanks for the heads up. Going to get it now. One question though, how can one lock down the layout of a custom workspace? i.e. every time I chose my custom edited workspace, the scripts and plugins open up, but never in the same layout. They’re scattered across my multiple screens, sometimes even above each other. It’s highly frustrating having to re-allign and fit them into a neat layout each time.